It’s Friday, and that means it’s time for another open and honest update on what we here at CSE have been up to. If you’re ever curious about our progress, you can check out our live streams and weekly updates to scratch that CU itch! If you missed today’s live stream with the man himself, MJ, you can find that HERE. We’ve been very busy with a lot of work we’d held off doing so we could get into Beta 1 strong. We didn’t have as much testing this week, partly because we have several big changes cooking, like building destruction and stability, as well as updating the client to 64bit and characters 2.0! We’re not planning on having any testing this weekend, but keep an eye on our tentative testing schedule next week! With the big changes incoming, we haven’t had enough changes this week to warrant a test just yet. Let’s jump to the Top Tenish for the week’s highlights. 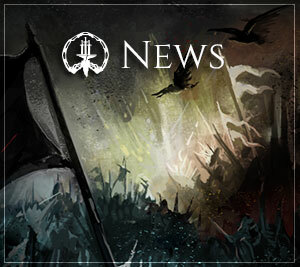 Tech – WIP Skill Parts and Statuses: With design in place for mage abilities and magic, we can begin planning out skill support to be more flexible and fully-featured. 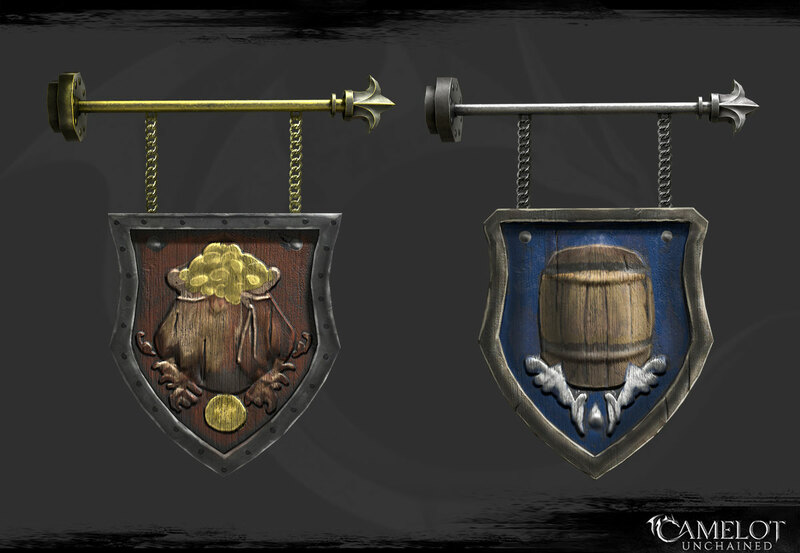 We’ll also work on tools to make the creation of abilities easier, so we can make the classes of CU. Tech – WIP Crafting UI: Our crafting UI is getting a complete overhaul to to be compliant with the next iteration of crafting, and for the long-term design of the system. We couldn’t have gotten through the first version in the way we did without all the work from Mod Squad member Mehuge, so thank you so much, Mehuge! For this next iteration, JB has been leading the effort on the CSE end to make the UI more user-friendly and accessible. Tech – WIP Coherent: This has been an ongoing task, but we are getting much closer. Matt and JB have been working hard to get Coherent fully integrated, so that we can move the client to 64bit. This is part of the whole “we’re ripping out CEF to put in Coherent” chatter that you folks have been hearing from us over the last few weeks. Tech – WIP NPC: Part of the ongoing componentization of entities has meant restructuring our prototype NPC code so that it can be configurable and editor-friendly. In non-dev speak, this will allow Design to quickly generate specific and generic NPCs for the game. Design – WIP Crafting System: MJ has been hard at work on the crafting system while mumbling about matrices, resistances, infusions, and grinning evilly. Maybe not as evilly as Christina Ricci in Addams Family Values, but we’re starting to worry. Animation: Scott worked through additional prototyping to support unique class idles with shared basic weapon attacks. Tyler is wrapping up the previous prototyping, and creating descriptions and graphs for engineers so they can support the need for a wide range of good-looking ability timings. Character Geo Improvements (topology): The animators requested some improvements to our Character 2.0 test model, and Jon has added these. This includes the previously-completed proportion improvements. Joe is now doing a rough weighting of it for testing. WIP – Hair/Rings/Necklaces: Jon and Tyler have been figuring out how to support new item slots, such as jewelry, and how best we can improve our characters’ hair without removing it completely for helmets. Tech – Light Shapes: A long-requested feature from the art team, Dave has given us the ability to create lights with various shapes. This allows us to more accurately match the specular highlight shape to the shape of the object casting the light. This also generally improves the visual fidelity of lighting in the game. Art – Music: dB is working on transitions between various music levels and improvements to his “instruments” to make things easier. His goal is to make combat feel more epic, depending on what is going on around you. Art – Deathmatch Map Update: Dionne is wrapping up improvements to the Deathmatch map. This includes an art pass on the raised spawn areas, as well as improvements to the general forest mod used there. Art – WIP – Production: Tyler has spent the week facilitating improvements to characters and animation. This now begins to turn into improvements in our workflows. New standards need to be written up and agreed upon, so we can speed up production, reduce errors, and be ready to outsource work where needed. 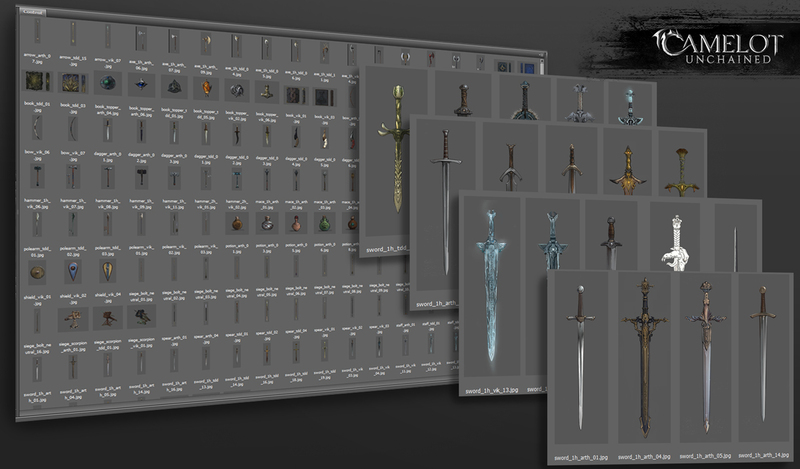 Art – WIP – Style Guides: Michelle has finished an audit of the weapons we’ve either concepted or created. That step allows her to begin working on a style guide for the weapons of CU. The weapons will later be updated to support our crafting system. 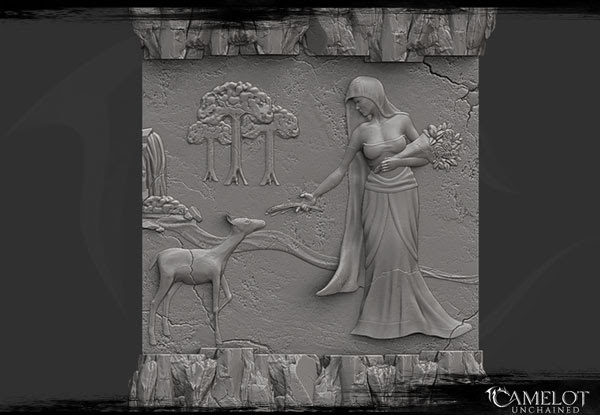 Art – Pict Fidgets: Sandra is wrapping up fidget animations specific to the Picts. These small touches are important for adding more life to the game outside of combat. For art this week, we’re a little slim due to the focus on making improvements to our work moving forward. Most of this work is prototyping and documentation. However, we still have a few things to show off! 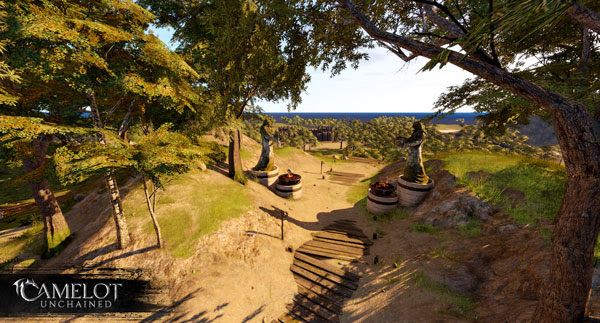 First up, Dionne has continued her work on the Deathmatch map. The player spawn areas were mostly barren, and needed a quick art pass. 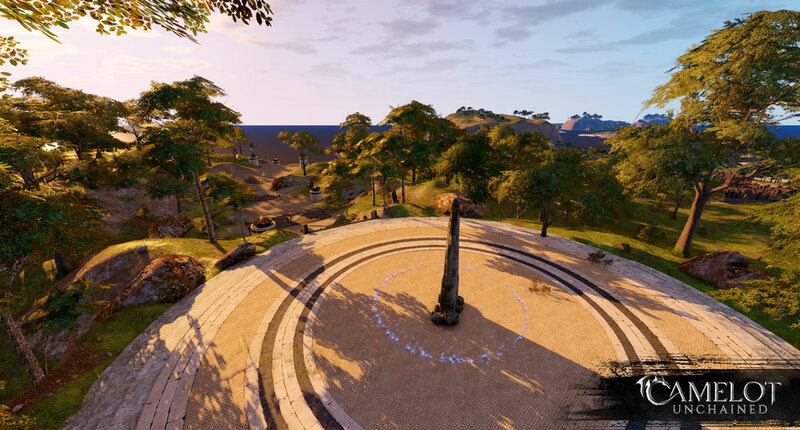 In these images, you can see the castle, an asset built in C.U.B.E. by our Builders’ Brigade, off in the distance. And this is simply the first step in testing. 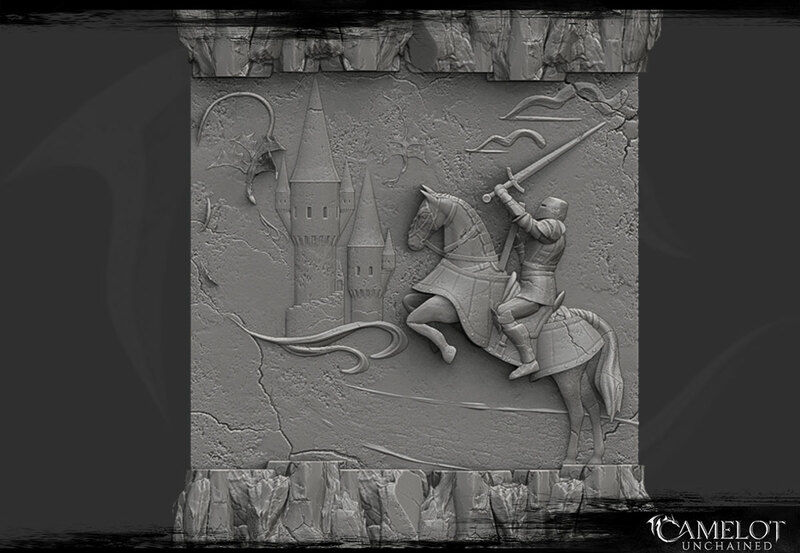 We’re looking forward to players building epic castles in a future scenario. 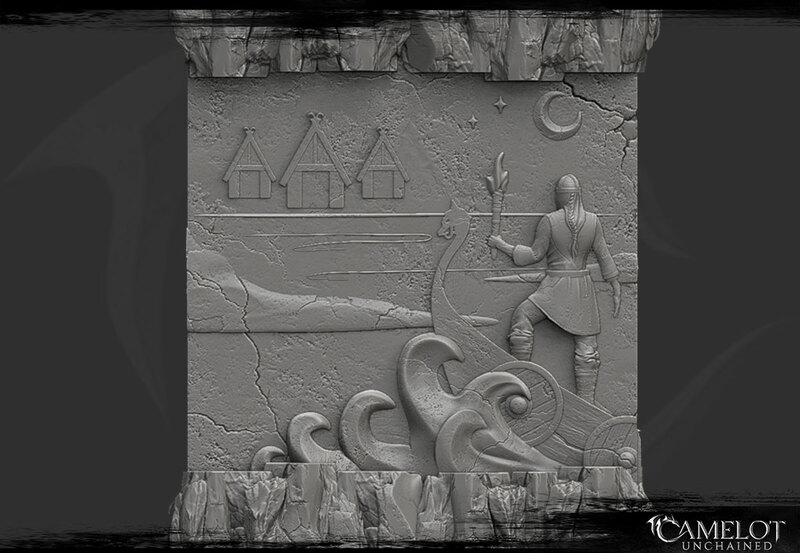 Jon made these relief sculptures, which we wanted to use either in the home islands or the Dragonfang scenario. We need to wait till we have more memory, which we will when we update to a 64bit client. The idea with these is to seamlessly integrate them into rock walls. Because they are independent of materials, we can pretty much use them anywhere. Here’s a bank and tavern sign for the Arthurians. You can see these on their home island, Briton. Per the Ttop Tenish, Michelle has been auditing all our weapons. As you can see, there are a lot of them. Here’s a sample! 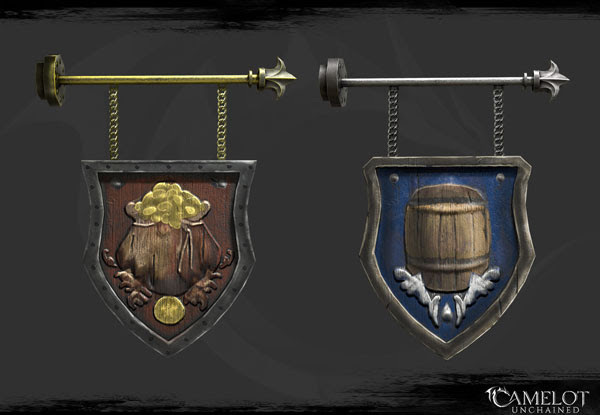 Besides the Style Guide work, one of the next things we need to tackle is making these harmonize with our proposed crafting system. Lots to do! This week, we owe a big thank-you to Ludovic, who sent these great gifts to Max! 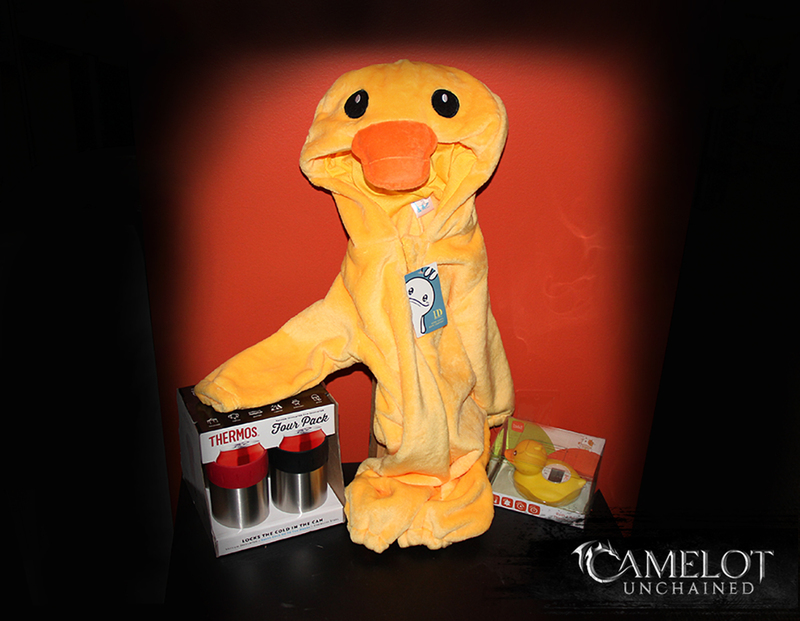 A duck onesie bath towel, for newborn Rose, as well as a rubber ducky with a thermometer, for testing that bath water. Also, they sent four thermoses to help keep our sodas cold! Thanks, dude! That wraps up the week for us here at CSE. We’ll CU next week!